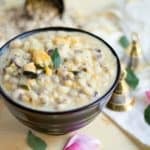 During the month of March, I posted quite a few Instant pot recipes like kalkandu Pongal, Tomato Pappu, Chaaru, etc. 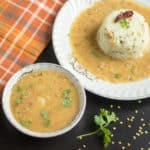 When I tried charu, I made a note to try the traditional paruppu rasam, and I duly tried it too. 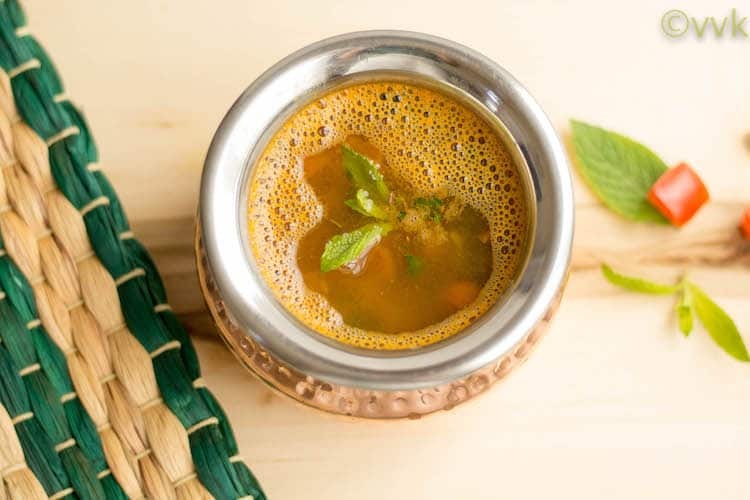 :-) Then I slowly experimented the other rasam varieties in the Instant Pot and this mint rasam are one among the successful ones. 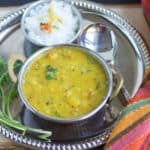 I love masoor dal, and I have already posted Broccoli masoor dal tadka and masoor dal sambar. When I can prepare sambar with masoor dal, why not rasam? To be honest, these days, I started using masoor dal a lot when compared to toor dal. It is light and cooks faster too. It makes cooking easy and tasty irrespective of any kitchen gadgets. The recipe is super simple, I used 1 cup tightly packed mint and divided into three portions, but not equal though. I took 2/3 of the mint and added it at the initial stage and then added a significant chunk from the rest and added while the rasam is simmering and finally used about 1 tbsp of mint while tempering. Didn’t I say, I loaded the rasam with mint? I did not use any curry leaves or cilantro, as I wanted only the mint flavor. But you can add curry leaves and cilantro as per your preference. Here is the video recipe of the same and Please subscribe to my YouTube channel and stay tuned for more exciting recipes. Wash and soak the masoor dal for 10 minutes. Meanwhile, chop the tomato finely. Wash the mint leaves and divide into three portions as mentioned above. Mix the 1 tbsp of tamarind paste with 1 cup of water and set aside. 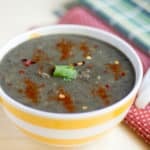 Add the tamarind water, 2/3 cup of mint leaves, washed and soaked masoor dal, chopped tomato, salt, hing, jaggery, ground pepper and rasam powder directly to the instant pot. Mix them thoroughly and cook this rasam mix in manual mode for 10 minutes and release the pressure naturally. Once the pressure is released, open the IP lid and then set the IP in saute mode. Mash the rasam mix nicely so that the dal blends well. Add half more cup of water and 1/3 cup of mint leaves minus 1 tbsp and let it simmer for 5 minutes. Meanwhile, do the tempering separately over stop top. Heat the tempering pan or kadai and add oil. Once the oil is hot, add the mustard seeds, cumin seeds, and mint leaves and as the mustard seeds start to splutter, add it to the rasam. Turn the IP off, and that’s it. Mint rasam with masoor dal is ready. 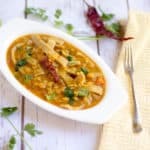 In a pressure pan or hundi type pressure cooker, add the tamarind water, 2 cups of water, 2/3 cup of mint leaves, washed and soaked masoor dal, chopped tomato, salt, hing, jaggery, ground pepper, and rasam powder and pressure cook for two whistles. Once the pressure is gone, add required water and remaining mint leaves and simmer the rasam. 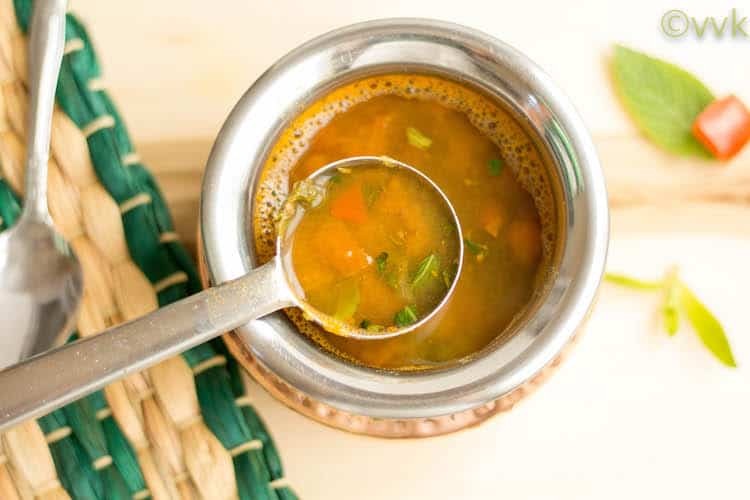 You can find the homemade rasam powder recipe here. You can add more water as per your preference. I prefer slightly thick consistency for mint rasam so went only with 3.5 cups of water, and that includes the tamarind water too. Instead of masoor dal, you can use toor dal too. To make it a one-pot dish, you can do the tempering first on the IP in the saute mode and then add all the ingredients. I loaded this rasam with mint leaves, and I am adding it in three stages. Also, I did not add, curry leaves or cilantro for this and went only with mint flavor. Turn the IP off, and that's it. Mint rasam with masoor dal is ready. 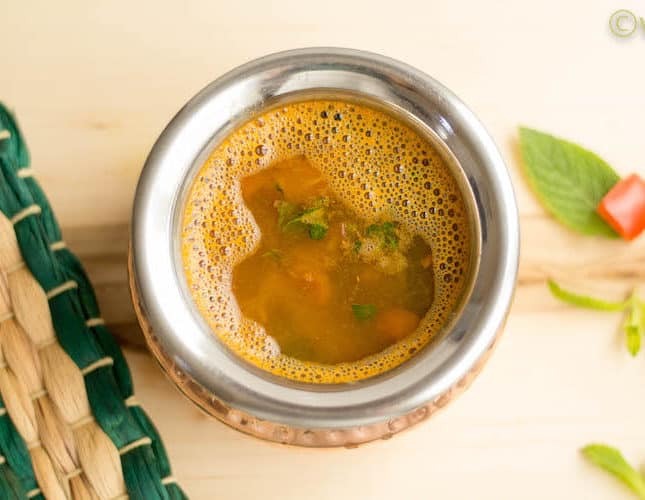 In a pressure pan or hundi type pressure cooker, add the tamarind water, 2 cups of water, 2/3 cup of mint leaves, washed and soaked masoor dal, chopped tomato, salt, hing, jaggery, ground pepper and rasam powder and pressure cook for two whistles. •	A simple one page print out option that I can print and take it to the Kitchen. Awesome . Awesome… There no better words to describe. Keep up with the exotic recipes. I have never tried mint Rasam.. frothy rasam always welcome this one is? ?